The information contained in this article will help you understand BPMN and and how it can help your business. Get a better understanding of this standard and easy-to-follow way of business process modeling method. BPMN (Business Process Modeling Notation) is a method of displaying business processes in the form of a diagram. It is widely used by both small business and large enterprises. Business Process Modeling Notation can range from simple, hand-drawn diagrams to complicated ones. There are all together four element categories that are used to create a common business process modeling diagram. By using BPMN, employees form different departments can comminucate directly and better understand the project process, thus producing efficiency within a business organization. This article will elaborate on how BPMN can help your business through 2 aspects. BPMN is used in business groups with a wide variety of targated audiences. BPMN can cover this wide range of usage to allow the diverse audience of the Diagram to be able to easily understand the process. This type of BPMN is internal to a specific organization, it is also called workflow or BPM processes. This type of BPMN doesn't cross pools, or organizational boundaries. If swim lanes are used in this kind of BPMN, then Sequence Flow of the Process will be contained within a single Pool and cannot cross the boundaries of the Pool. Message Flow can cross the Pool boundary to show the interactions that exist between separate private business processes. This type of BPMN is between a private process and another participant or process. The abstract process only include the activities that are applied for communicating outside the private business process. Abstract processes are contained within a Pool to show the Message Flow between the abstract process activities and other activities. 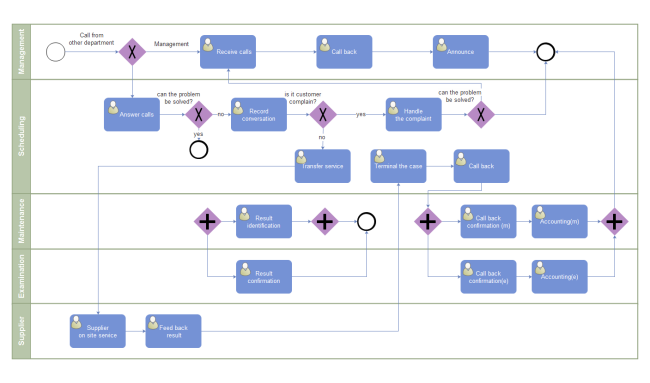 This type of BPMN shows the interactions between two or more business activities. Collaboration processes are contained within a Pool and the different participant business interactions are shown as Lanes within the Pool. Reduce costs and improve revenue streams. Nowadays, businesses are looking for ways to improve efficiency and paying more attention to process management and improvement, process awareness and process thinking is getting more attention. BPMN can help an enterprise achieve these goals in its business strategy by providing the enterprise a more organized process improvements.